If you are going to travel to the EU with your pet in 2019, please read this urgent message as actions may need to be taken as early as November 2018. As always, we advise clients to think about what they may need to do well in advance of travel, and to allow at least four months before the date of travel to make sure they can meet any new requirements. This means if you are wanting to travel on the 30th March 2019, you will need to speak to your vet before 28th November 2018. Current requirements include making sure your pet is microchipped, vaccinated against rabies and has been treated for tapeworm. 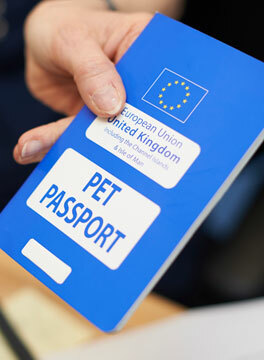 You can read more about these requirements on our pet passports page. When visiting the practice for a pet passport, make sure to have a chat with your vet for further advice on protecting your pet abroad against ticks and other biting insects, as well as what preventative treatment is available before you go. For more information on our top travel tips for pets or how to keep your pet calm during travel please view our general pet advice section. To book your pet in for an appointment, please contact us.